Chickpeas sundal or chana usli recipe - This is an easy and healthy dish that you can make for this Navratri. 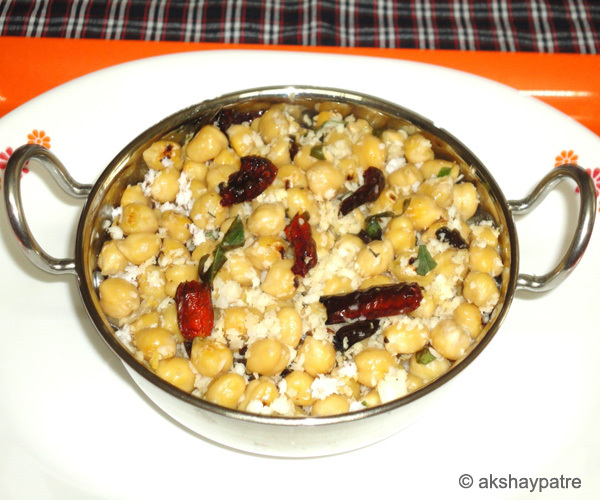 This is made by boiling the soaked chana or chickpeas first and then seasoning with dry red chillies and curry leaves. Fresh coconut adds an extra taste to the dish. For fasting dish, we do not use mustard seeds for seasoning. However in case you are not on fast, for better taste you can use mustard seeds for seasoning and coriander leaves for garnishing while preparing this dish. Usli can be consumed either for breakfast or as a fasting dish. I have already posted couple of usli recipes such as shenga usli and moong usli which is similar to this recipe. Usli is also known as sundal, guggillu and is a very popular dish in South India. Wash and soak the kabuli chana for 7 - 8 hours. Drain water and add sufficient water. Pressure cook till 3 -4 whistles or till the chanas become soft. When the pressure releases, drain the excess water and set aside. Heat oil in a pan, add the red chillies and saute till light brown. Add curry leaves and saute for a while. Add boiled chana, sugar and salt. Mix well and saute for a minute. Add the fresh coconut and stir for a minute or till the coconut combine well. Remove from the flame and serve the kabuli chana usli hot. 2. Heat oil in a pan, add red chillies and saute till light brown. Add curry leaves and saute for a while. Add the boiled chana, sugar and salt. Mix well and saute for a minute. Add the grated fresh coconut. 3. Stir for a minute or till the coconut combine well. 4. Remove from the flame and serve the chana usli hot.